"One at a Time," by Lissa Marie Redmond, in Down & Out Magazine, Issue 2. It's just my luck to get locked in a trunk of a car so old there's no emergency latch. Some people will whine about anything, won't they? That opening sentence stole my heart, in part because I know that if I had been writing this story I would have gone for the cliche: I was trapped in the trunk of a car, on my way to certain death, or the like. Instead our hero is griping about the lack of modern conveniences. That's just lovely. Marcus is, as he admits, a screw-up. In and out of jail. Now a bad guy gives him a simple job: pick up this 1969 Ford Fairlane and drive it to a specific spot. Collect five grand out of the glove compartment and walk away clean. Easy peasy, no? I love stories about a guy who is ashamed of himself for what he sees as weakness, namely having done the right thing. By the way, the publisher sent me this magazine for free. "Burnt Orange," by Shawn Reilly Simmons, in Passport to Murder, edited by John McFetridge, Down and Out Books, 2017. This is Simmons' second appearance in this blog. "Burnt Orange" is a fresh tale, by which I mean it went in directions I did not expect at all. Shelby is a teenager with a problem. She likes to burn things. Her mother is driving her to a reform school. Her mother, by the way, is a narcissist and a bit of a fabulist, which is no doubt is connected to the roots of Shelby's problems. So I was expecting a story about a troubled kid, and I suppose in a way that's what I got. But there are worse people out there than Shelby and her mother, and folks with worse problems. And if Shelby thinks fast enough she may be able to save a few lives. She may even get to use her, well, special talents to do it. "Jerusalem Syndrome," in Passport to Murder, edited by John McFetridge, Down and Out Books, 2017. This is Davidson's second appearance in this column. Usually when I point out that I might not be objective about a story it is because I am friends with the author (like last week). This week the reason is different: I have visited most of the places she describes. Suzanne is visiting Israel for the first time. It would be a great visit except for the people she is traveling with, a group from her church. Well, not exactly her church. Husband Bobby made them join it because it is the road to promotion at his company. And the head of the church, Pastor Ted, is a major jerk. He's the one who brings up Jerusalem Syndrome -- and let's talk about that for a moment. It refers to a mental derangement in which the patient, typically an American or European Christian visits the Holy Land and freaks out. Suddenly they are out on the streets of Jerusalem, wrapped in bed sheets, proclaiming themselves John the Baptist or Mary Magdalene. I understand why it occurs. People have heard about these places since they were toddlers and suddenly each one is real. The road you take to Jericho is the same one in the parable of the Good Samaritan. It's sort of like visiting the Black Forest and the tour guide casually pointing to a decaying cabin and says "That's where Goldilocks met the Three Bears." Except more so, because this is about your religion. Some people's heads just explode. When I read the story I thought it was odd that Pastor Ted describes something much more minor as Jerusalem Syndrome, but it actually makes perfect sense. He is a control freak and part of that is attacking any sign of rebellion. And Suzanne is beginning to rebel... I enjoyed this story a lot. 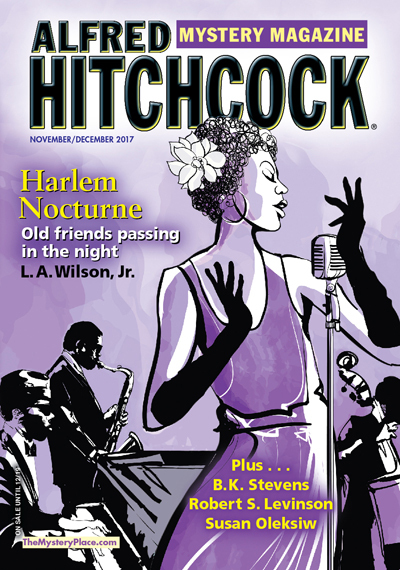 "Black Friday," by R.T. Lawton, in Alfred Hitchcock's Mystery Magazine, November/December 2017. I knew that if I wrote these reviews long enough I would eventually have to tell you about George F. Will. That day has come. In 1980 President Jimmy Carter debated candidate Ronald Reagan. Among those asked on television to evaluate their performances was conservative pundit George F. Will. Not surprisingly he praised Reagan's showing. More surprisingly, it turned out that he had been one of Reagan's debate coaches. So he was praising his own work without bothering to mention it. And that's why you have never heard of George F. Will again. Here's why I bring this up. R.T. Lawton and I are first readers for each other. Before I send a story to an editor I ask him to critique it. He does the same with me. That means I read an earlier version of this story and made some suggestions for improving it, a few of which, I think, the author took. So you can argue that I have no subjectivity about it now. All I can say in reply is that the first version I read would also have been the best of the week, before I got my grubby hands on it. This is part of a series of stories about Yarnell and Beaumont, a sort of low-rent version of Donald Westlake's Dortmunder and Kelp, marginally successfully thieves. It is the day after Thanksgiving and Yarnell is visiting a pawn shop to retrieve his wife's wedding ring. Unfortunately there is a robbery going on. "Not so fast," said the robber. Yarnell wasn't sure if that meant he was now supposed to move in slow motion or not at all, so to be on the safe side, he quit moving altogether. In fact, he thought it best under these circumstances to have his brain check to see if his lungs were still pumping air. Eventually Beaumont shows up. He is the smarter half of the team - although that is not a fast track by any means - and finds a hilarious way of settling the issue. My favorite element of this story is Lebanese George, owner of the pawnshop who remains unflappable. Another day, another hold-up. Ho-hum.